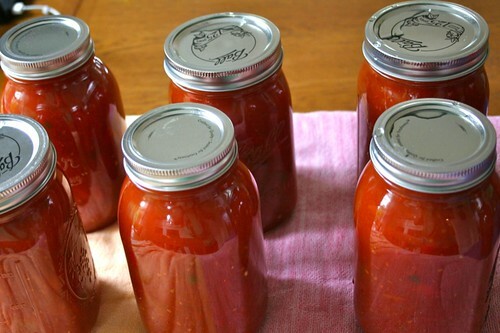 My most favorite of tomato canning recipes? By far, no questions asked, chili sauce. It ends up making the best meals during the winter, paired with black or kidney beans, ground turkey if you like, and just about any skillet free-for-all, this chile sauce is a great staple in the pantry. Using the best of the harvest at the height of the season, tomatoes + chiles + spices and all things good just make for an awesome combination. Ooh and it uses a spice bag. 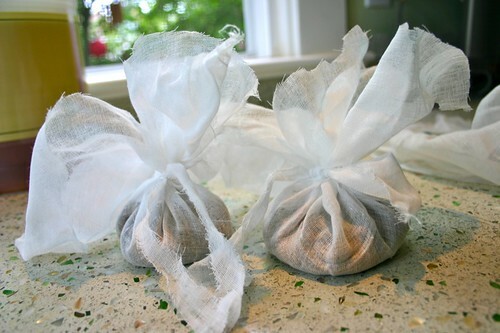 You gather your spices, and wrap them up in cheese cloth. I use a slice of cheese cloth to tie the bag shut. And then off they go into a vat of tomatoes to season themselves off. I use a variation on the classic chili sauce recipe in the Ball Canning Book and I have to tell you, it's a delicious recipe. It provides the perfect amount of sauce and tang to a winter dish. 1. Combine the tomatoes, onions, bell peppers, jalapenos, sugar and salt in a large sauce pan. Cook over a low flame for 40 minutes. 2. Tie the spices in a cheesecloth bag and add to the tomato mixture. 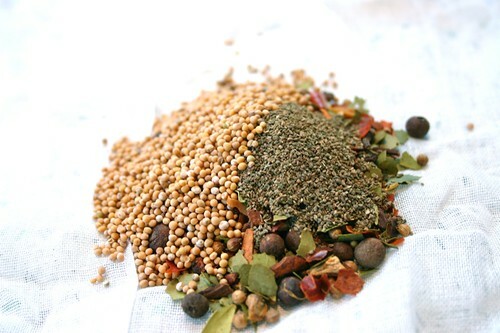 Cook until mixture is reduced by one half about 45 minutes. As mixture thickens stir frequently to prevent sticking. 3. Add the vinegar and cook slowly until desired thickness. (we used very juicy tomatoes this year: this took hours.) Remove spice bag. 4. Pour into hot jars, leaving 1/4 inch of headspace. Adjust caps. Process for 15 minutes in boiling water bath canner. 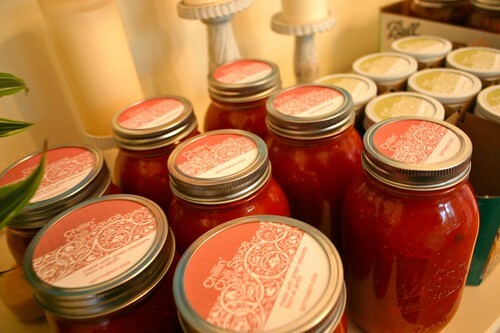 you're killing us with these canning labels. as a comparison, I've been scrawling w/sharpie on the lids lately. me too, i might even brig the canning pot in out of the tuff shed. Did I mention that this happened 30 years ago? Okay Lelo, I swear to God I posted this yesterday, but I guess it didn't go through. SO I'm guessing I can use this chili sauce to make a pot of chili? I've canned a TON of tomatoes but this is my first time trying chili sauce. It looks wonderful! I've already got the first 6 ingredients simmering on the stove! Also, where did you create those beautiful labels?? I'm planning to sell some of my canned goods at our church bazaar and I think a pretty label would be a greats sell point! Got suggestions? I've vowed to can tomatoes and tomato sauces and maybe even something like this chili during this summer. I've lucked into a bunch of quart jars, so all I need is a place to do it. I remember reading about a commercial kitchen (not that I need a fancy canner or something, but big spaces to work with big pans) that is available for rent by the hour to people. Did I read about that here or are you aware of such a place? Its not just the flavor I'm after -- its the planning and preparation and the "wows" that may come in winter, 2010, when I use them. Who would have thought this old man could so such a thing. Thanks for the nice note. I don't believe I wrote about a commercial kitchen. I know there's a canning resource library in North Portland, but a kitchen itself, I'm a little stumped. If I do find one, I'll leave another comment on this post. Do you seed and skin the tomatoes or just slice and use? I love Lynne Rossetto Casper, don't you? 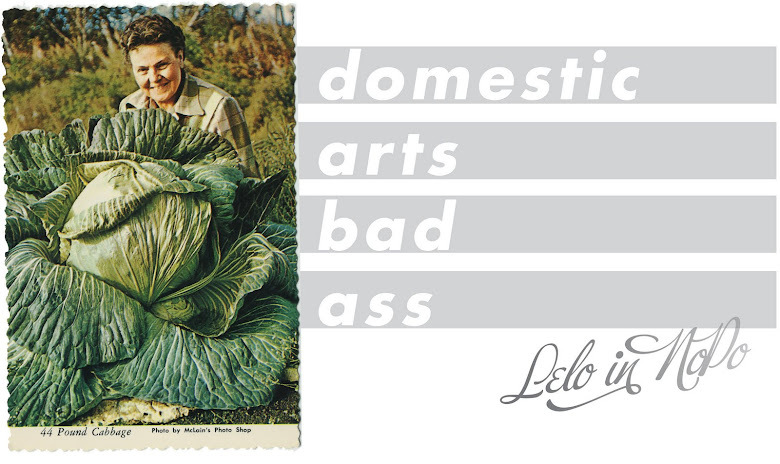 We grow 'em big here. How did that Pie-Off go anyway?